Osprey Ariel vs Aura - which is better? OK ladies, listen up - Osprey designs some of the best women's hiking backpacks around, and the Ariel and Aura are no exceptions. You'd do well with either, but there's a few key differences depending on your needs and wants. Overall, however, for us the Aura is definitely the better option for most women. It has pretty much all the features the Ariel does, but with additional pockets and enhanced access to your tools and gear when out on the trail. The Aura's extra capacity is also going to be a winning feature for most. Read on for our full review of both the Ariel and the Aura, including the shared features and major differences. We've included some product videos too, so check them out if you're really serious about one of these packs. ​If you are looking for a really lightweight backpack, you are probably better off going with the Aura than the Ariel. While the weight difference is not huge, every ounce counts. The Aura is just a little lighter than the Ariel, which can make a pretty big difference when it comes to traveling long distances, especially if you have a lot of gear to carry with you. ​What is pretty surprising is that the Osprey Aura is lighter than the Ariel, yet somehow has a higher internal volume. Therefore, if you need a lightweight backpack with a lot of storage space, we would recommend going for the Osprey Aura. We think the fact that it manages to be lighter than the Ariel and have more storage space at the same time is pretty neat no doubt. ​When it comes to weather protection, the Osprey Aura is the better option. The Osprey Ariel is made out of very durable and lightweight materials, ones that are resistant to the rain. This is pretty decent no doubt. However, the Osprey Aura actually comes with a separate rain cover. This rain cover is 100% waterproof and will keep all of your belongings safe and dry. It is not like the Ariel won’t keep your stuff dry, but it can’t stand up to the same amount of punishment from Mother Nature as the Aura can. Now, when it comes to external storage space, we want a backpack that has ​plenty of room for gear and supplies. The Osprey Ariel does come with a decent amount of external storage space. It features 5 zippered pockets and 3 enclosed pockets, which is definitely not bad at all. However, this is still not as good as the Osprey Aura. The Aura comes with the same number of enclosed pockets but has 1 more zippered pocket for added storage space. ​Compression is another important feature to look out for with any hiking backpack. This allows you to cinch the bag together to make it less bulky and easier to carry. It is a great option for keeping sleeping bags and clothing from expanding. The Osprey Aura comes with 4 side-mounted compression straps and 1 internal strap. This is more than most other hiking packs come with, but still not as many as the Ariel. The Osprey Ariel comes with 4 side mounted, 2 front mounted, and 1 internal compression strap. This is much better for providing you with a compact backpack for hiking. All in all, the Aura also seems to be the more comfortable of the two backpacks. While the Ariel does have a lot of padding, good ventilation, and many points of adjustment - actually more than the Aura - the general consensus is that the Aura is in fact more comfortable to wear for long periods of time. ​Osprey A​riel vs A​ura - How Do They Compare? 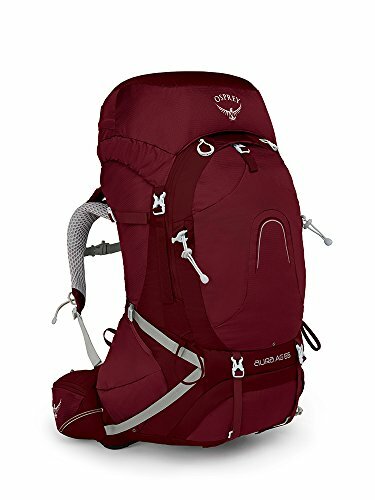 ​​Another similar – and popular - women's hiking backpack​ is the ​Gregory Mountain Products Deva 70 Liter Women's Multi Day Hiking Backpack (​link to Amazon). ​While we ​like the ​Gregory Mountain's Deva backpack, ​it doesn't quite reach the standards of ​Osprey's Ariel or Aura. ​​This is a very lightweight backpack with a surprising amount of storage room, but it does not fare so well in terms of ​design and ease of access. It doesn’t come with as many compression straps or cool features as either the Ariel or the Aura. ​And it's not as ​aesthetically pleasing, in our opinion. ​​​At the end of the day, we think that both the Ariel and the Aura are really great hiking backpacks in their own right (​links to Amazon). However, we think that the Osprey Aura is the slightly better product. It has a little more room while also managing to be a little lighter than the Ariel.